The Art of Vicki: Ta da! Here are some newer pieces of work I have completed in the last couple of weeks. 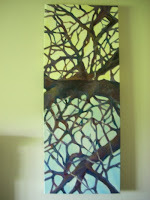 The first is a painting that i started and finished last night, title is tentative. I wanted to work in a somewhat representational abstract construct, playing around with color and shape. An experiment of sorts. 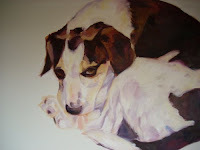 The second is a painting I did for my mother of our dog Kipper, its dont on a square canvas, and took about 8 hours to complete. 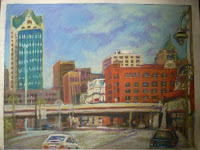 Lastly another pastel of downtown milwaukee off of water street. I love this spot and visit it often, alot of good memories tied to this place, which is why I love working on downtown milwaukee images so much. Everything is relevant when tied to the emotional response we have with the subject matter we are projecting. I will be posting more soon, in the meantime thanks for checkin in!! !